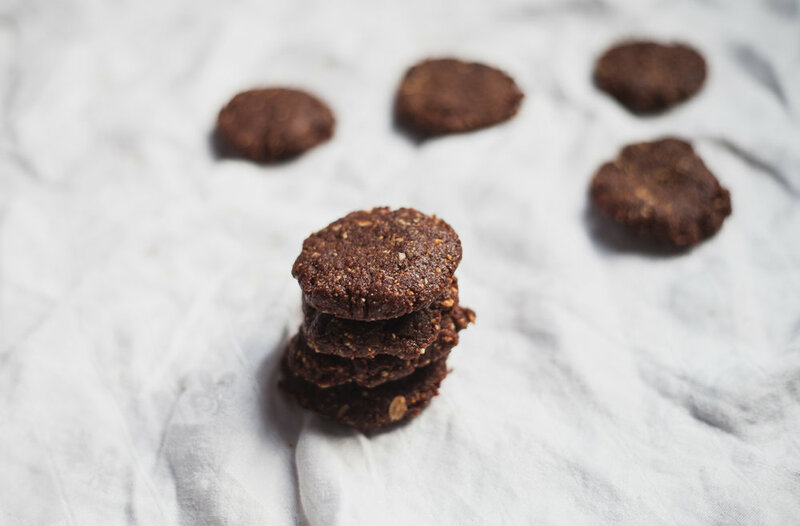 chocolate almond date freezer cookies -- no bake vegan, gluten free cookies that whip up quick -- recipe via will frolic for food. These cookies are crack. Crack cookies. Once you start eating them you forget where you are and what you were doing and how many cookies you've consumed and then they're all gone and you're blaming your neighbor who must have snuck over and eaten them when you weren't looking. But, no. That's the nature of the cookies. And they're damn easy to put together so it's not even fair, really. Our human monkey brains don't stand a chance when these are hanging out on the side table whilst you're watching heist movies. I created these out of an urgent desire to eat something cookie-like when there was nothing sweet (except dates & chocolate) in the house. There were definitely no cookies hanging out like burn-outs in the corners of my cupboards. Any cookies that come into my house are hoovered instantly. It was late, the heat of the day was just dissipating, and I'd already put way too much effort into dinner (those kale pesto flatbreads because I had some time on my hands). So I grabbed what I had (chocolate, dates, almond butter, oats), mashed em into a dough ball, and separated a couple of cookies out for Logan and myself. P.s. I think this would be really delicious with a pinch of cinnamon or vanilla. In a medium bowl, add dates, almond butter, oats, and chocolate. The heat from your palms melts the chocolate and helps get it incorporated in the mix. Knead for about five minutes (it takes about that long to get everything mixed together). Place your "dough" in a blender or food processor and blend for 30 seconds. The heat from your blender will further melt the chocolate, and chop up the oats so that they incorporate more easily. Remove the "dough" from your blender, and split it up into 8 golf-ball sized rounds. Flatten the rounds into cookie shapes (about ½ inch thick). Freeze for 15 minutes (minimum). Remove and enjoy! Cookies can be stored, frozen and sealed, for up to a month.